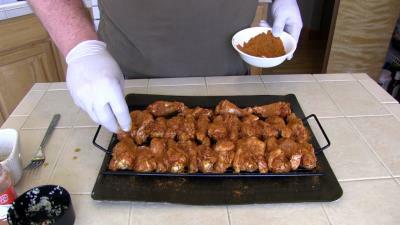 SmokigPit.com - Garlic Mad Hunky Hot Whangs slow smoked on a Yoder YS640 Pellet smoker. This smoke usually takes approximately 3.5 to 3.7 hours to cook. Place 1/2 the wings in a large bowl. Mix together 1/2 cup Extra Virgin Olive Oil, 5 cloves chopped garlic and 1 ybsp Cayenne pepper. 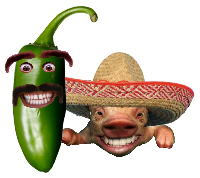 The Cayenne is for added heat so if you are not fan of spicy hot wings leave the cayenne pepper out. 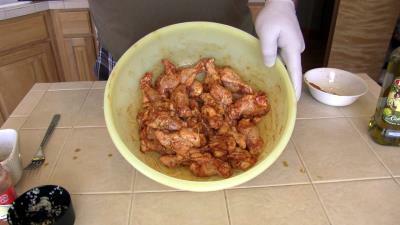 Mix thoroughly then pour 1/2 of the oil over the wings and stir them until they are all coated evenly. Sprinkle on some Mad Hunky "Hot Whang" Chicken Rub. How much you put on will determine the heat level. Place the wings on a greased smoking rack and coat with Mad Hunky Hot Whang Rub. Flip the wing parts and season them just as you did the last side. 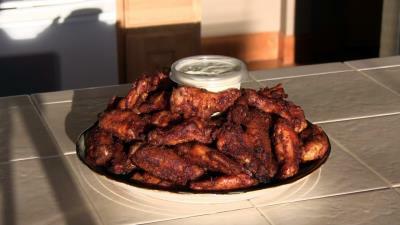 Let the party wings sit for about 20 minutes in the fridge. Next place them in a pre-heated smoker @ 245 degrees. In a misting bottle mix 50/50 water and cider vinegar. Smoke the wings for about 1.5 hours then mist them with cider & vinegar solution and flip them over. Shake on some more Mad Hunky Hot Whang Rub and mist. 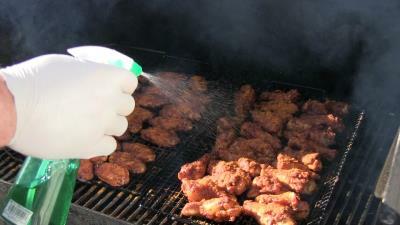 Continue misting the wings every 1/2 hour or so until the internal temperature reaches 170 degrees. This recipe is very easy to prepare and the results are amazing. 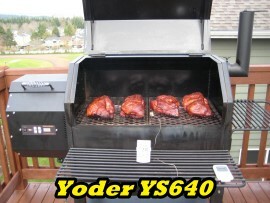 This recipe was smoked on A Yoder YS640 Pellet fired smoker using hickory & cherry pellets mixed 50/50.